2. You can print your own designs on the lable area. 3. With creative design, competitive price and prompt delivery. 4. Customers' design and ideas on the products are greatly welcomed. 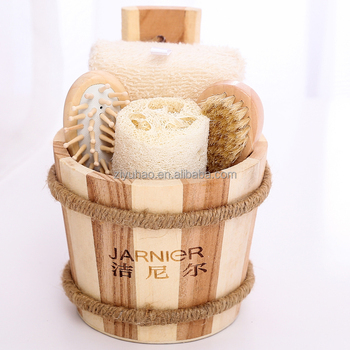 We not only have a large production base, advanced R&D technology and equipment, but also have a talented design team who are able to select bath products, baskets, Wood Bucket,Wooden box,and accessories to create stylish bath gift sets.we are full of confidence that we can satisfy our customers with high quality,competitive prices,prompt delivery and reliable service. A:Our Minimum Order Quantity is 500pcs for each design, for bulk quantity could be negotiated. A:Both samples & price list are available but pls offer us which exact designs you would like, so we can send you the exact catalog covering the item and similar. Q:What is your price term& payment? A:Price term FOB, CIF,EXW and others available. A:Around 25-45days, exact time based on your quanity. Q:Does any certificate to prove your products? A:Sure, we offer Fumigation Certificate, Form A, Form E, C/O, etc. And our products could pass SGS test, and at the same time, we can offer our samples to you for test.